It was very exciting and hosted by one of my favourite blogs in the history of forever (many a recipe I make come from them!) – Exclusively Food! As an appreciative gesture to the wonderful ladies at this blog, Amanda & Debbie, I decided to do a combination post from the two things I won – a gorgeous bunny cookie cutter (too cute!) and some bunny moulds (too awesome!) 🙂 – Plus, after such an absence I think all of you, my friends and foodie inspirations, deserve more than one recipe! 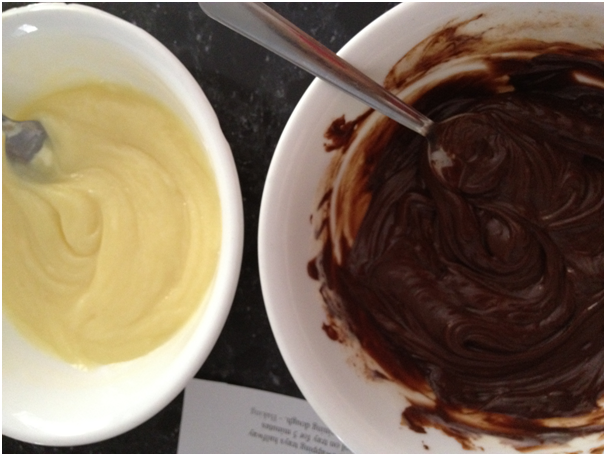 But that is ok – Next time (I promise there will be a next time) if I am swirling, I will not make ganache and just swirl normal chocolates together. Second part of the prize was my cute bunny shaped cutter. I just scream with cuteness overload looking at it – EEK! 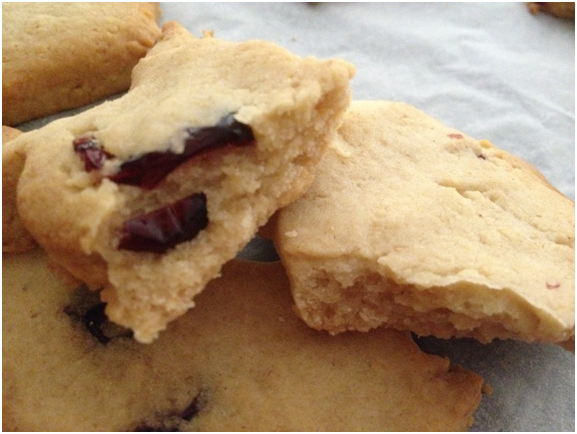 Spiced Craisin Honey Biscuits. Shaped like bunnies. What gives these cookies (originally simple honey cinnamon biscuits) such Autumn-y perfection? The honey subtly leaves a thrilling aftertaste while working with the spices to create an aromatic yet sweet biscuit, also providing a soft texture. The slight tartness of the craisins balance out the biscuit perfectly. While I was away, I was also thrilled to receive five more awards 😀 – Thank you to all these fantastic bloggers! Laura @ Sprint 2 The Table presented me with what I like to call, The Smorgasbord Award – a mishmash of lots of blogger awards into one – Thanks so much 🙂 – Laura is the creator of healthy but indulgent desserts – she is a miracle worker! 9. Rock music beats hip hop for sure! 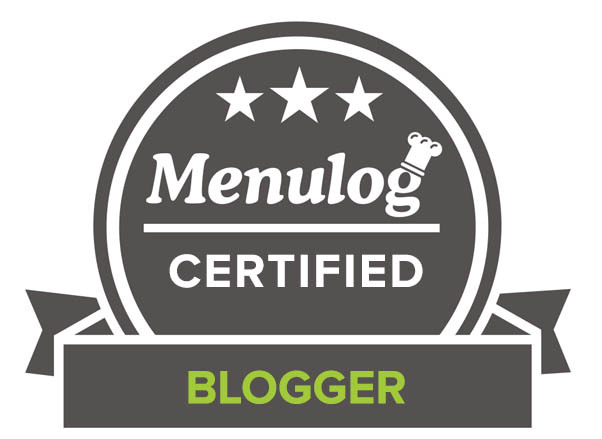 Secondly, Lisa @ Sweet 2 Eat Baking awarded me the Versatile Blogger Award – too sweet (pun intended of course :D) – Lisa has some of the most beautiful food photographs ever – every cake, every cookie I wish I could grab off the screen! 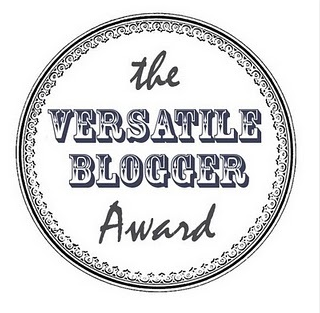 I was most thrilled to receive the Versatile Blogger Award also from a very talented baker friend of mine, Jennie @ The Messy Baker – she is bright, bubbly and nothing she bakes or cooks turns out messy, believe me 😀 – Same as above, you can find the rules at her awesome website or here! 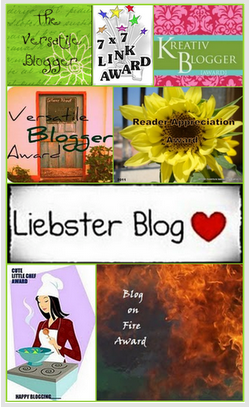 Anne @ Anne Sture Tucker awarded me The Liebster Award – It is much appreciated my friend 😀 – Recently discovered, Anne has such an awesome style – her cooking makes me so hungry I cannot even tell you! Before I let you go (I know, I have written yet another insanely long post but seriously, I cannot seem to stop typing ;)), I need your help to settle a domestic dispute. Her and I both agree – omelettes are eaten with tomato sauce. It is normal to have sauce at breakfast. Sauce enhances the flavour. Now you may be a little hazy about them but you will meet them again this year later on – PDS and TT – These two actually cannot understand eating sauce for breakfast. It is unheard of. It takes away from the flavour of the omelette. This poll will close after one week! I love your bunnies faces!! Too cute!! It was fun learning more about you! Congrats on the award! And your cookies look so cute! Welcome back! And it was a pleasure to visit! So cute – no worries, everyone needs a break now and then – hope your’s was wonderful! I am so happy you enjoyed! Welcome back! Glad you had a great trip. The bunnies are adorable! 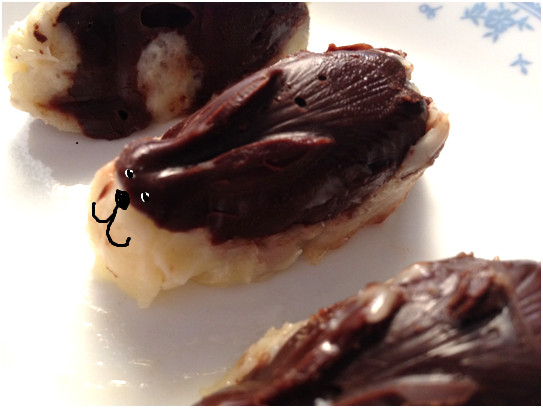 And I am very happy you enjoyed these bunnies! What a come back! 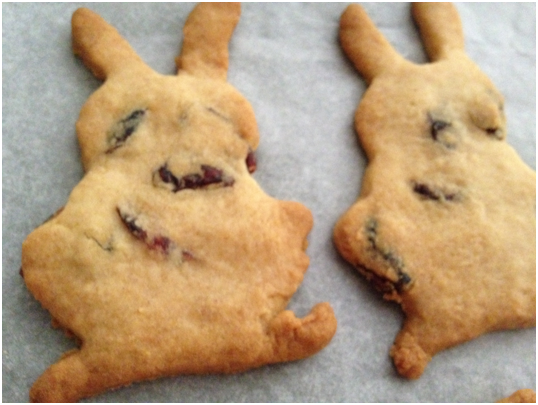 Chocolate bunnies and delicious honey craisin bunny cookies!! Love both! The honey cookies sound absolutely fantastic. Good luck with your many exams! Hopefully you get study time full of chocolate and other delicious treats! Love the cookie cutters/ bunny molds. Congratulations on all your awards!! Welcome back! And just in time – I need my sweets! I was going through withdrawal. 😉 Nice post! Some really good, inventive stuff going on in your kitchen. Thanks so much. Thanks for enjoying this post my friend – you are too kind! Welcome back! I have never eaten an omelet with sauce – I’m not sure I understand. Your cookies are adorable. Thanks my friend 😀 – Glad you enjoyed the cookies! Glad to have you back, dear! Congratulations on winning the giveaway! Love the treats you made! And congratulations on all the well deserved awards…you rock, girl!!! Welcome back and well done on all those awards! Hope you had a great time and thanks soo much for the awards! Great post, as usual! Welcome back and congratulations! Hope you’ll do well for the upcoming exam! And YAY for sauce right? But it seems like we are going down in the poll which I am getting ribbed for 😉 – at least us sauce lovers can stick together! Welcome back and good luck with your exams! Those bunnies are just adorable. Great post and welcome back! Those sweet treats sure look like it would kill the cravings! Thank you for sharing and have a lovely day!!! I promise you, I cannot even remember having cravings now 😉 – Glad you enjoyed my friend and hope you too have a wonderful day! Thanks so much for your award! That’s so sweet of you!! 🙂 Oh yeah, I know!! The joys of school! I’m so impressed that you’re able to maintain this blog with school! You deserve an award for that!! Welcome back and congratulations on the awards! You made me laugh on mu blog, why I you obsessed with Russia? ok, I am very glad you like it, I was born in Sovient Union, I am from Moldova we were a part of Russia! I can’t decide which bunnies I like more! I must say that I really love the two-tone chocolate bunnies — even if the white didn’t set as well. They inspire me to go buy some molds! Hope you had a good break!!! Moulds are the best and I sincerely recommend them! I did have a wonderful break thank you and I hope you have an awesome upcoming weekend! Oh! my.. I am in chocolate heaven.. LOL.. am loving those cute bunnies too.. Gosh Choc Chip Uru, you are such queen with everything that incorporates chocolate.. Right now, I am just drooling over all your chocolate recipes.. Hope you had a wonderful easter and have a good week ahead. Cheers, Jo. Welcome back and good luck with all your exams. Your bunnies are really cute. Glad you enjoyed the bunnies! Welcome Back! 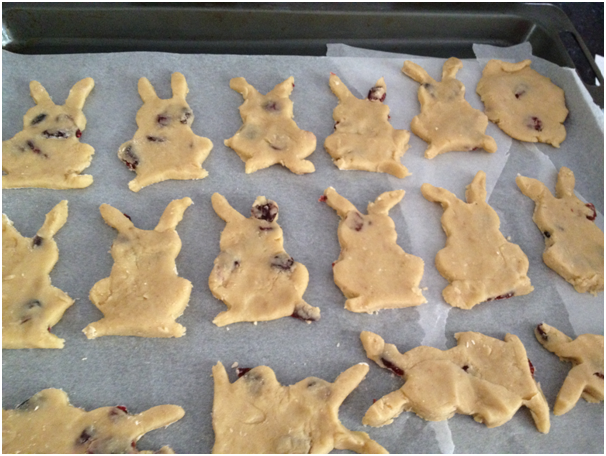 Cute bunnies, they look delectable! I know what you mean about being MIA or posting sporatically, I took a bit of a break myself. Good luck with school and thanks for visiting my site. It was nice just to relax and let go for a little while but feels even better to be back – thanks for the good wishes on both counts my friend! And it was a pleasure to visit your blog! Such a great blog! You’re amazing! Good luck with the exams! Welcome back! I hope you had a lovely vacation–who would have thought there would be snow in Tasmania? Those bunny biscuits are too cute! Loving your welcome back post! I am glad to come with lots of bunny treats to share! So many delicious chocolatey goodies on this post! Welcome back, sometimes a break is needed! Welcome Uru 🙂 seems like you’ve had a great time away ~ I always like going to Tassie even if it’s just for a couple of days it’s so relaxing and serene there 😀 Glad to hear that you’re back though because now we get to read your posts! Don’t worry about being slow! I’ve been pretty slow too lately sigh…things can get so hectic honestly! I did thank you 😀 – I agree, Tassie is so peaceful, almost like NZ no? Congratulations on your awards. Good luck with your exams, just thinking about taking exams makes my head want to explode! 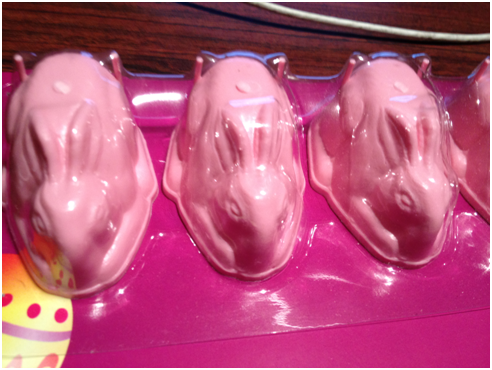 The bunny molds are absolutely adorable. Thank you – the spices make this cookie for sure! Hahahah my first crush was Aladdin too!! I was dying laughing when I read your list! And welcome back 🙂 We’ve missed you! Good luck with all of your studying!! And congrats on all your awards, you so deserve it! Those bunnies are very very cute! 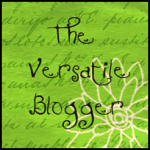 And I have added you to the blog page! Welcome back! :). And just look at those cookies.. they are calling me.. calling me :). both of your bunny creations look adorable + the biscuits sound sooo tasty, especially for the afternoon with a nice cup of tea. congrats on all your blogging awards – you deserve ’em! And I appreciate your support – too kind! I am sure we will figure out the solution too though 🙂 – I went through a phase where no one’s blog comments were appearing, confusing me totally! Now it is all better! Omg the little bunnies are soo cute!! Glad you’re back! Take a bit of a cooking break before you start cramming for those exams! Good luck with all of them! How nice to come back from vacation to prizes and blog awards! Hope you had a good break and best wishes with the remainder of your tests and school year. Congrats on the awards and winning the giveaway! Those bunnies are too precious! Are those bunnies flippin’ cute or WHAT?! Happy belated Easter! Glad to hear you got some time in the kitchen. Those “wins” are awesome! And you put them to creative use too!!! I’m going to remain neutral on the poll but I can”t wait to hear the results! Thanks for trying though! I love the wins too – it was so much fun using them! Sounds like you had a wonderful vacation…welcome back 🙂 Your bunnies are just adorable! And congratulations on all of your awards as well! I definitely did 😀 – It is great to be cooking again! And thank you very much my friend! I have been away myself so I do understand you in every bit! Its nice to have a break and I really hope you enjoyed, the give away presents are too cute and even if it didn’t work out as you planned I bet they were a perfect bite. I did watch a really interesting show on the telly during Easter that involved loads of chocolate. The man (don’t remember his name, but he was a genius) said that when melting chocolate the tempering process is the key. I have not tried that myself, but it worked out pretty easy for him. The way it says on the net (I researched on how it temper) it looks to me way too complicated, but what he did was pour some melted chocolate to some cold surface (he used marble) and move it around with spatula until it started to set and then added to the rest. Anyways hope you enjoyed your time off, Best Wishes! Sending hugs! I will definitely remember those tips on tempering – so helpful! It sounds like a lot of fun in your vacation! Glad you are back and these cookies is the best way to celebrate your comeback! Thank you my friend on both counts! Too funny.. I was just reading through blogs thinking how I missed you and wondered where you’d gone.. Ta Da! Here you are! And once again I am transported into your world of beautiful sweet delicacies!! Love your bunnies today! Welcome back! and good luck with your exams! congrats on your well-deserved awards – your blog is so much fun to read and filled with amazingly delicious treats, love it! thank you so much for giving us an award, it is such an honor! Thank you 😀 You are very kind my friend to say such wonderful things about my blog! As for the award it is much deserved and I hope you enjoy it! Good to see you back! And I want a bunny!!! They look yummy! Aww, I love those bunny cookies. I keep forgetting it’s fall where you are! I bet it’s beautiful this time of year. And that honey looks irresistible! Haha yes poor us just under the equator 😉 – though I envy your Spring, Autumn seems magical with all those falling leaves – beautiful for sure! Good luck with all your exams! I’m sure you’ll do great. Love the cookies too! And glad you enjoyed the cookies! What a post! Congratulations on all the blogging awards, and on the cute Easter goodies. I envy you your trip to Tasmania. I live in North America and I don’t know if I’ll ever get there, but it sounds wonderful. But feel free to take a looong plane ride and visit the beauty of Tassie! Nice to have you back! Bunnies everywhere!!! Make those snickerscottis and you will know exactly what heaven tastes like. Thanks so much! Good to have you as a friend. I too love having you all as friends though and not confused about that at all! Welcome back…. The bunnies are really cute! And good choice! These biscuits dipped in some sweet tea are perfect to face the day! Congrats on the giveaway, awards, and vacation! I’m not usually very lucky when it comes to giveaways, but I did receive the Liebster and my hubby and I also just went on our own vacation (we were in New Orleans–so much fun)! Welcome back Uru, and congrats for all the awards! there is always an argument in our house as well when I serve ketchup with omelette. Except me Noone eats it. Actually I loveketchup, I even eat with Parathas, whT ever savoury. the cookies look beutiful . And you have taste – sauce is absolutely the best! I do not understand how people cannot – savoury and sauce are made for each other! 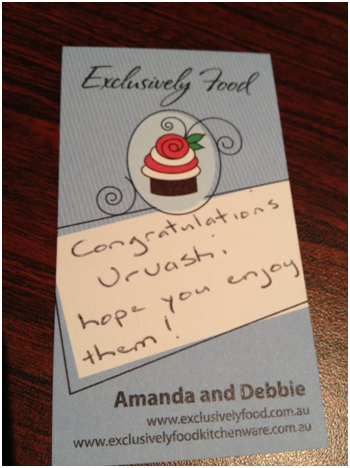 Glad you enjoyed the cookies – they taste awesome dipped in sweet masala tea! Thank you so much for such kind words! I can say the same if not more for you – your blog has become one of my favourites to read and every post makes me smile! Hi, its great to have you back and sharing all the wonderful baked goodies. I am sure you had a great time in Tasmania and don’t we all need the break from time to time to explore other places for relaxation. And I agree, relaxation from holidays is the best there is and necessary time to time! I think the no-saucers are winning, sorry. 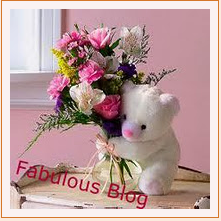 And the shout out was lovely on your blog – you deserved it and awesome work doing a free for all! Wov … what a passion – all the small details. Great post …!!! Good luck with your exams – and your return here. I am thrilled you like my post 😀 – paying attention to even the smallest things definitely makes a difference! Thank you for the good wishes my friend! Welcome back, hope you had great time there! Congratulations on winning the giveaway & for all the awards. Lovely recipes, these cookies look so cute! Best of luck for the exams! Welcome back! I knew I was missing one of my favorites :-)! Great post! Welcome back! Good to see you in action again. 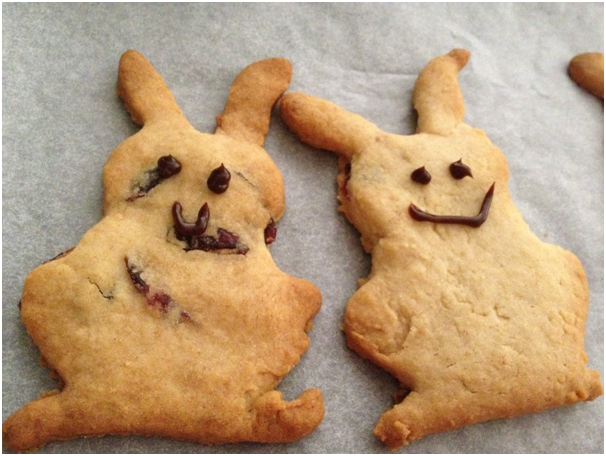 These bunny cookies are adorable! Congratulations on all your wonderful awards. I am so glad you enjoyed these cookies! 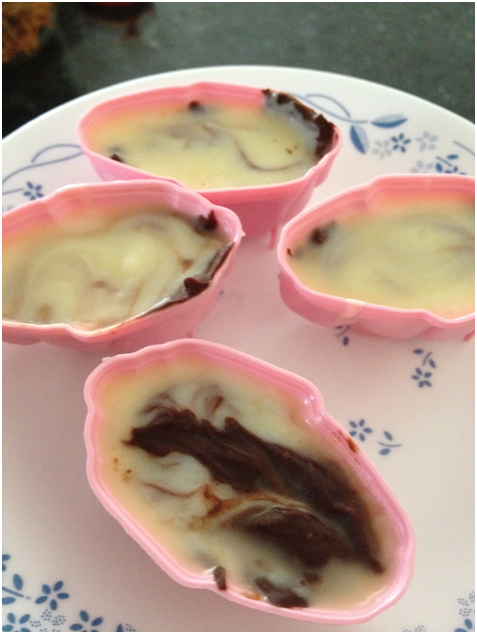 I make chocolates a lot and a little tip is to line the mould with chocolate. 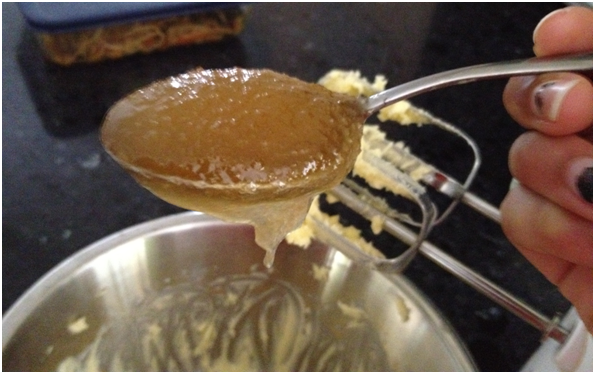 Allow it to set hard and then put in your filling and swirl as much as you like. Welcome back sweet friend! I know you are busy these days and I am glad you went on vacation. We all need a break from our busy lives. Do not worry about your blog or your blogger friends, they will always be here. You are doing the right thing by prioritizing your studies. Your bunnies all look so tasty. This looks like a visit to the bunny farm, but better because it is an edible farm. The candies as well as cookies do have your creative trademark for making delicious goodies-yum! Happy Monday. Welcome back, I’m with you in the studying, few more weeks and we are DONE!!! First, welcome back! I’ve missed your posts! There was a hole in the foodie world while you were gone! And then thank you SO much for the awards!!! This was a great thing to wake up to today! Love the bunny cookies!! Sorry you’ve got so many tests, but glad to see you posting even if just for a moment. we’ll see you when you get back from testing! Glad to have you back. Good look on your exams and thank you so much for the award. Super sweet! You deserved the award, beiieve me, because your blog just makes me hungry all the time! Thrilled to hear you had a good break! Best of luck with all of your exams coming up. Congratulations on your prize and all of your wonderful awards! And no matter what your bunnies look like, I bet they still tasted incredible. Hmm, seems I am a fence sitter about the tomato sauce with an omelet! welcome back gorgeous, good luck with your exams! glad you had a good holiday and fun in the kitchen with all your prizes. Well done on the awards, and thanks for sharing 🙂 Good luck with the exams! Hello, it’s good to have you back and I love your bunny cookies. 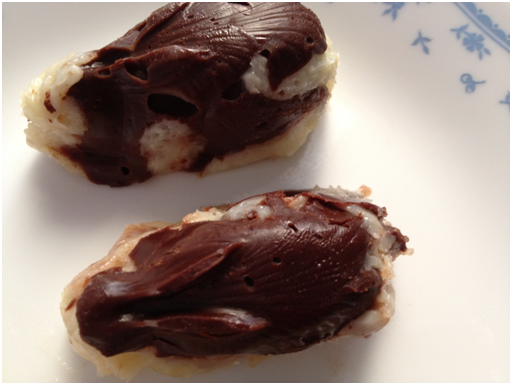 If we’d been here for Easter I’d have made these. I’m back from my son’s wedding in Senegal too so am getting back to posting. Good luck with all your school work. Try out these SNickers Bars from shelikesherfood.wordpress.com/2012/04 When you have time. They are amazing and have TWO chocolate layers! How exciting the wedding must have been – Congrats and hope it went wonderfully! Wow! Very awesome! It sounds like you had a really great time. What a nice suprise to come back to your prize package!!! Thank you so much for the nomination, greatly appreciated too!!! Your welcome my friend it is most deserved! Welcome back! Thank you do the shout out. Those bunnies are adorable!!! Thanks 😀 – you deserve this shout out and many more! I’m so glad your back! I was wondering what happened to you! I hope you had a wonderful time in Tasmania. And congrats on all your amazing awards, and winning that giveaway! These cookies are oh-so-adorable, and I love that you added more nutmeg and allspice. Well done!